Is the Ruc-Tote the Kinder chocolate or Swiss army knife of luggage? - Well Dressed Dad - It is a proper menswear blog. Like, with original words and opinions and suchlike. Is the Ruc-Tote the Kinder chocolate or Swiss army knife of luggage? Combining features has long been a way for products to innovate. The Germans do the Kinder Eggs, promising three distinct joys for a single purchase. 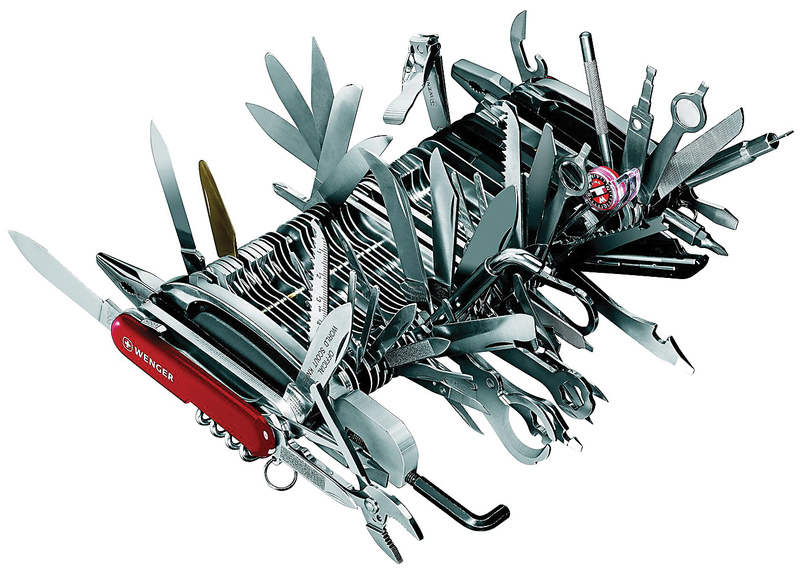 The Swiss army have, by way of Victorinox, Wenger or whatever, introduced the world to the sheer joy of combining an increasing number of tools in one (now barely) hand held piece. I’ll not hotly debate whether this is a good or a bad thing at this point, as today I’m looking at something entirely different. Ok, I lied. A little. When it comes to Swiss Army knives, my father and my self have diametrically opposite opinions (i.e. he thinks they are awesome, and I don’t). Replacing an entire tool chest with miniature versions, all cobbled together in one unit means you have a pocket full of pretty rubbish tools. The only advantage is that you may actually have a tool in your pocket, whereas you rarely carry around a tool chest. I will state for the record that every single tool you find on a Swiss Army knife is significantly poorer than the standalone version. Now, on with the regular programme. If a similar principle of combining features was to be used with a piece of luggage though, could that be done successfully? This is the premise J. Panther Luggage Co have put forward with their Ruc-Tote (it’s ok, it’s not just you, I also think they could have come up with a better name). The premise is that a piece of luggage is a container that can be filled, and it’s what comes outside that which determines if it’s to be a tote-bag, a ruck-sack or a carry bag. To this I do sagely nod my head, there is a valid point. So looking at the details, what do we have here? Well, my bag is one of their Special Edition ones, available in either this grey deadstock Swiss loden wool. Deadstock? Ticking boxes here indeed. This loden was apparently produced up till the 1980s by Eskimo Textile in Switzerland and came to JPL by way of a Japanese collector. 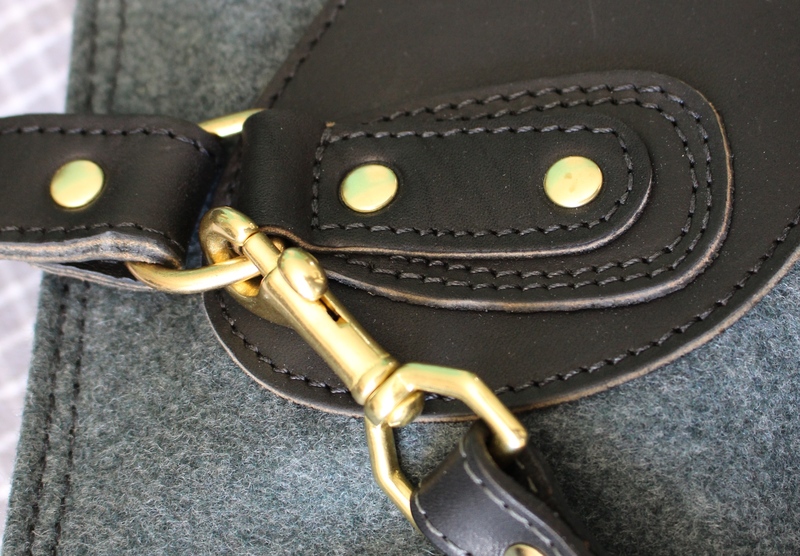 The leather is from the well known Horween tannery in Chicago, so also a quality component. Apart from there there is solid brass hardware and a YKK zip. All good bits. It’s also made in the USA, by craftsmen that know how to assemble a solid and long-lasting bag. The bag itself is of a decent size, with an extra pocket on the inside large enough for a laptop and another 2 open pockets on the outside. And then there are leather straps. Galore. Because this is where we get to the three-into-one functionality of the bag. Ruc-tote, right? As in both ruck-sack and tote-bag. Or even a hand-carry bag. So we find straps to allow you to carry as a ruck-sack. Straps to allow you to sling it over your shoulder. Or, if you unzip it, shorter straps to let you carry it in your hand. And the idea is definitely a clever one. Does it work though? Yes, though in 2 modes more than the third. Getting the straps for the tote-part to work with the straps for the ruck-sack part means they are fixed length. This is fine for toting it around, as those straps need to be the same length. The fixed length of the ruck-sack straps though means that unless the straps fit you as they are, you may struggle to wear the pack. I can just about make it work when wearing a thin jacket. Is loden wool a good fabric for a bag such as this? It sort of depends what you’re after. It looks and feels very nice, contrasting nicely with the leather and brass. I’m hoping it will hold it shape fairly well, though it is pretty soft and flexible. It is said to be highly durable and naturally water repellant, though I think I’d take another option if I knew it was going to rain. I would have liked to see a leather bottom on it, both for strength and in case I put it down on the floor. Oh, and really, the plethora of straps does get a little much when using it as a carryall. Which makes it a little like a Kinder egg, where frankly the best is the chocolate, right? If deadstock multi-purpose luggage is your cup of tea, they also do a version in 1950s Czech army tent canvas. I’ll tell you something else as well, you could fit a proper load of good tools in one of these!